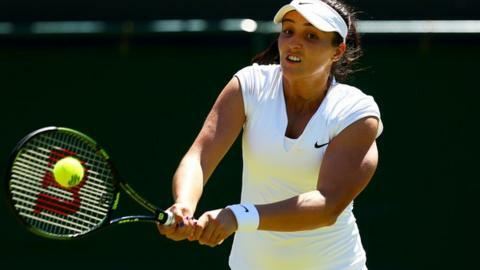 Former British number one Laura Robson will be entered into the main draw of next month's US Open in New York courtesy of her protected ranking. Players are allowed to enter eight tournaments based on the ranking they had before a long-term injury lay off. Robson made her comeback from a wrist injury in June having not competed since the 2014 Australian Open. The 21-year-old was a wildcard entry at Wimbledon, losing 6-4 6-4 in the first round to Evgeniya Rodina. She is currently competing in an ITF tournament in Granby, Canada, which is a level below the WTA Tour, and is set to play Naomi Osaka on Wednesday night in the first round at about 00:00 BST. Should she win, it would be the Briton's first singles victory since September 2013. Robson ended 2013 ranked 46 in the world but her absence from the sport means she is now 913 in the world.